Ah McDonald's Singapore, it's pretty obvious what you did this time. Unlike recent promotional burgers in Singapore, this one straight up copied Burger King's seemingly popular Rendang Burger. When I first saw a promo poster for one a few months prior, I thought it would be pretty good, but seeing as every time I've had Burger King in Asia and been severely disappointed, I gave it a miss. When I was in Zanzibar and saw that McDonald's made one of its own, I was looking forward to giving it a try as I'm a fan of Rendang. For those readers not from the region, read a bit more about rendang here. We wanted a few days of home cooked (read: Korean food) meals after returning from our long trip, so I held off trying the Rendang Burger for a few days after getting back. This was probably a mistake because my wife got word from one of her Korean friends that the burger was "disgusting" because it uses cocount milk, (the only thing Koreans hate more than coconut milk is cilantro!). My wife had real rendang with me before, and never complained, but I knew that she had a bias going into the McD's to try this one out. 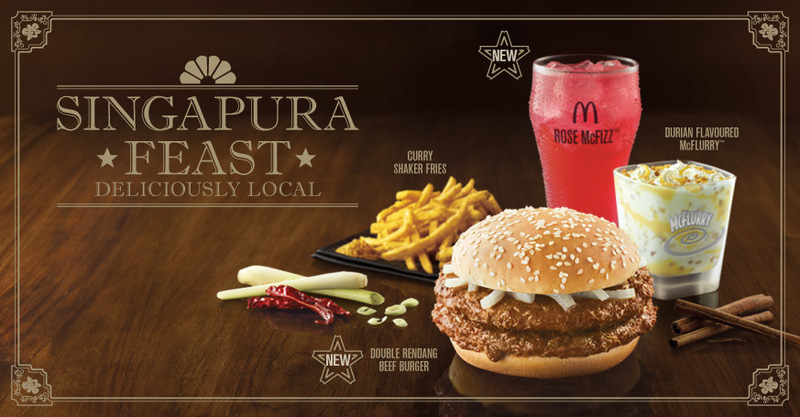 Also, McDonald's Singapore tried to be a bit cheap, as they didn't launch a new range of promo sides along with it, but rather kept marketing the existing Durian McFlurry, and Curry Shakers along side this new burger. Those fingernails are not mine, promise! The burger looked identical to the Samurai Burger last year (which should be back anytime now, as it's currently back in Malaysia), which meant it was a thicker beef patty covered in sauce, a standard bun, and a bit of onion. Actually, it looked pretty pathetic, when I opened the box. I took the first bite, and was more than pleasantly surprised that it actually had a very nice rendang flavour to it. The onions didn't add all that much flavour to the strong sauce, and it probably would have been better sauteed. As always with these "bigger" promos here in Singapore, they seem to forgo any additional veggies, and tomato and lettuce would have been a perfect addition, just onion was a bit too basic. When they are charging over $7, (and nearly $9 for the promoted double) for a combo you should be getting a bit more, quite a bit more in fact. Sure the sauce tasted good, quite good actually, but this it shouldn't cost nearly that much. The taste was there, it just wasn't worth the money at all. Also, as expected, my wife took one bite and refused to eat the rest. My Korean mother loves Cilantro. I wonder if it is because she lives in America or what. But she dislikes most American food but loads up Cilantro when she can.